Early reviews of the HTC One M8 are mainly positive as the device is similar to its predecessor, which was arguably HTC’s best ever handset. In fact, the company says the 2013 version of the HTC One was its top selling phone of all time. Given that the 2014 edition keeps many of the same design attributes, I’d be wouldn’t be surprised if the HTC One M8 doesn’t set a new sales record. Still, the phone is worth a closer look to see what’s different, what’s new and what (if anything) is less than desirable. A review unit from HTC was waiting at home for me while I was across the country for Microsoft’s Build conference, and I’ve spent a little time using the phone since my return. In no particular order, here are some of my first impressions. The materials, fit and finish of this phone are outstanding. The quality rivals, if not exceeds, that of Apple’s iPhone 5s. I like the curved, brushed metal back because it makes the phone easier to handle; important because it’s larger than last year’s model. The 5-inch screen is bright and crisp from all angles. It’s relatively cloudy today, so I haven’t yet viewed the display in full sunlight. 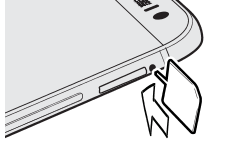 One design choice I question is the microSD card slot. HTC typically doesn’t include space for memory expansion, so I’m glad to see it on this handset. However, you need a small tool to open the slot, the same type of tool you’d use to remove the SIM card tray. A small paper clip likely works for this, but I don’t foresee people carrying the included tool to open these slots. Just like on the older model, this new HTC One has what the company calls “BoomSound” with dual speakers above and below the display. And just like on the older model, these are louder than most other phones’ speakers, offering excellent sound quality and punchy bass. I really like the feature that turns the phone on without using the power/wake button. Tapping twice on the screen when holding the phone in portrait mode wakes it up. Swiping down on the screen when the phone is sleeping activates voice dialing — very handy. I can’t yet speak to how long the 2600 mAh battery will keep the phone running, but it does charge very quickly: roughly 10 percent in 10 minutes, at least when the battery is nearly depleted. Although HTC doesn’t specifically mention it, I suspect the phone takes advantage of Qualcomm’s QuickCharge technology found in the Snapdragon 801 chip. The HTC One M8 supports 802.11ac on both 2.4 and 5 GHz. With my 802.11ac router, I’m seeing great wireless range and speeds around 35 Mbps over Wi-Fi when farthest from the router, roughly half of what my home broadband is. 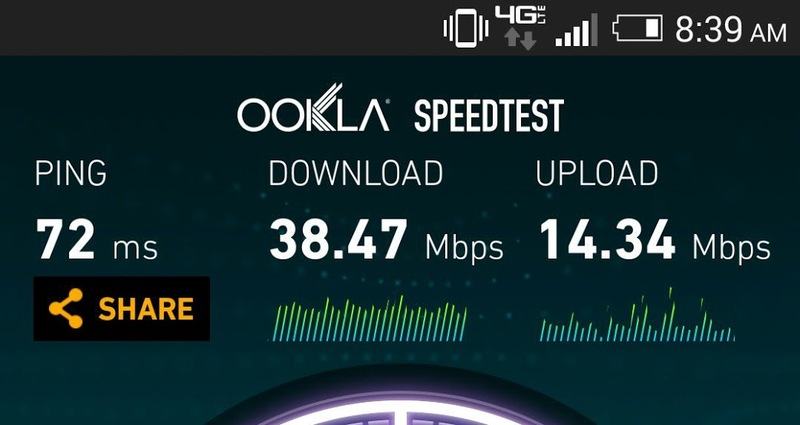 Verizon’s LTE is testing slightly faster than that. I’m surprised that HTC kept its Ultrapixel camera sensor the same in this model. So far, it takes relatively nice pictures, but seems challenged in certain lighting situations; the HDR mode hasn’t worked as well as I’ve seen on other phones. The added depth sensor comes in handy to refocus an image after the shot, but you have to use the standard camera mode for these pictures; the refocus option won’t work if you take a pic with non-automatic settings such as burst mode, the Zoe camera for short videos, scenes or filters. HTC’s Sense software is a fairly clean and intuitive interface. Apps are pre-grouped when appropriate, i.e. : Amazon, Google, Tools, etc… There is a group for pre-installed Verizon apps on this handset with a dozen different titles. I don’t see an easy way to uninstall or hide them. The Blinkfeed screen can be removed in the phone’s settings, but if you try to add a home screen to the left, it will re-enable BlinkFeed. Five additional home screens can be added to the right of Blinkfeed. In just a day’s worth of general use, I’m pretty impressed by what HTC has here. 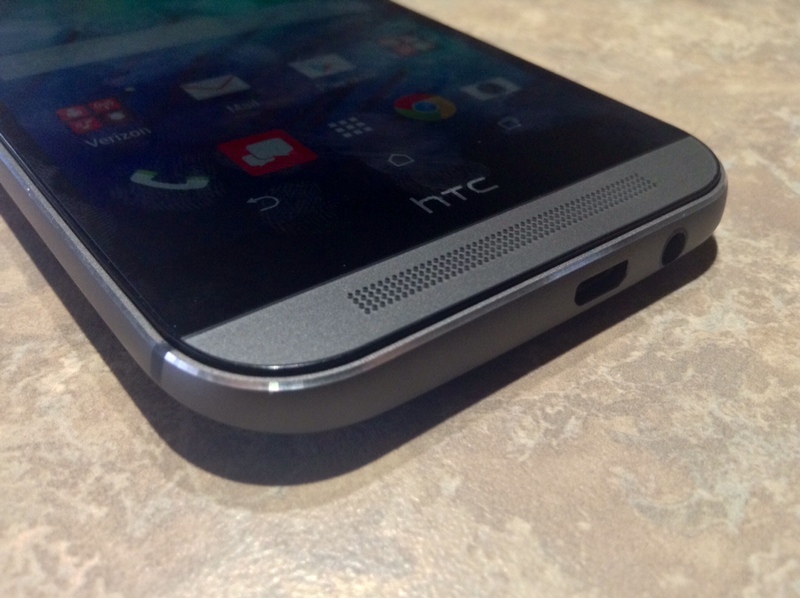 The HTC One M8 is put together nicely and offers good computing and wireless performance. I’ll need to use the camera more to get a better feel for its capabilities and spend a few days using the handset as my main phone. I’m used to — and admittedly partial to — the size and unique features of my Moto X but so far, I could see myself happy with the HTC One M8. I’ll have a full review in the coming days to see if I still feel that way. Is Android broken and if so, will Google fix it?